Left: The North home, shown here, is today the site of North Park. Right: Ann Loomis North as a young woman. 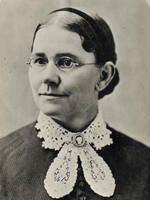 Ann Hendrix Loomis North was the second wife of Riverside founder John Wesley North and mother to his six children: Emma, Richard, Edward, John Greenleaf, Augusta, and Mary. They married in 1848, after he had become a lawyer in New York State. Prior to becoming a lawyer, North had been a preacher and had attended Wesleyan University. In 1849, the Norths moved to St. Anthony, Minnesota where John was elected to the second legislature of the Minnesota Territory. He was defeated in his bid for reelection in 1851. John North was influential in the founding of the University of Minnesota, wrote the legislative act that became the university’s charter, and was treasurer of its board of regents from 1851 to 1860. In 1855, North became one of the founders of the Republican Party of Minnesota. He also purchased 160 acres of land and platted an entire tract of 320 acres, founding the town of Northfield. Ann assumed the social and cultural role of a politician’s wife. Ann’s family, especially her father, supported many of North’s financial ventures. In Northfield, on October 1, 1856, the Norths founded the Lyceum Society, the beginning of many other cultural and educational organizations that were part of North’s ideals for the new town. The panic of 1857 ended John’s dreams for Northfield and he suffered financial failure, but despite this setback, North participated in Minnesota’s state constitutional convention that year. A friend, Charles A. Wheaton, purchased North’s business interests. At this point, the North family had grown to five of its eventual six children. In 1860, John North was a delegate to the Republican convention that selected Abraham Lincoln as the party’s candidate for president. After Lincoln’s election, he appointed North to be the official surveyor of the new territory of Nevada. The North family moved west and John supported them with his surveying position, practicing law, and investing in silver mines. He became the territorial judge for Storey County and president of the commission to draft a constitution for Nevada. The next five years were difficult for the family. They moved first, in 1865, to Santa Clara, California, and then to Tennessee, where North again hoped to establish an egalitarian community. In Tennessee, the family suffered financial difficulties as a result of a boycott of North’s business ventures. The source of the boycott was reputedly the effort North, an abolitionist, made to prevent the lynching of a black man. In 1869, North began to plan a new model colony in earnest, and in 1870, while still in Knoxville, he issued a broadside advertising for colonists to join him in investing in land in California. North came to Riverside in 1870 and his wife and children followed. The family lived in the building adjacent to the Southern California Colony Association offices on the west side of Market, between what is today Mission Inn and University Avenues. John and Ann’s son, John Greenleaf North, worked in the Colony offices as a telegraph operator. Ann’s talents as a musician and collector of songs were much appreciated in the new community. She also gardened extensively. The family later moved to Mission Inn Avenue at Vine Street, where they built a home and had a very large garden. North lost control of the Southern California Colony Association in 1875 in a dispute over rights-of-way for a new canal being constructed by rival S.C. Evans and his New England Colony. In 1879, the North family moved to San Francisco, but John Greenleaf North stayed behind to practice law in Riverside. In 1880, John North left San Francisco to become the agent for the Washington Irrigated Colony near Fresno. Ann did not join him in this move. In 1931, the city of Riverside dedicated North Park on the site of the North’s home. The North’s surviving children made a gift of a rose garden to the new park in their mother’s honor.